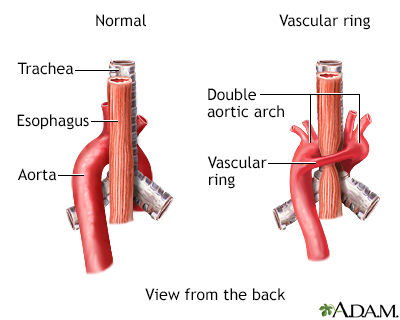 Vascular ring is a term used to describe a number of abnormal formations of the aorta, the large artery that carries blood from the heart to the rest of the body, or of the pulmonary artery. The abnormal vessel(s) forms a ring, which encircles and may press down on the windpipe (trachea) or the esophagus. The additional pressure on the windpipe (trachea) and esophagus can lead to breathing and swallowing problems.